I was just about ready for spring until all 20.1" of my snow-pack melted away with the warm weather last week. Now I wouldn't mind a bit more. 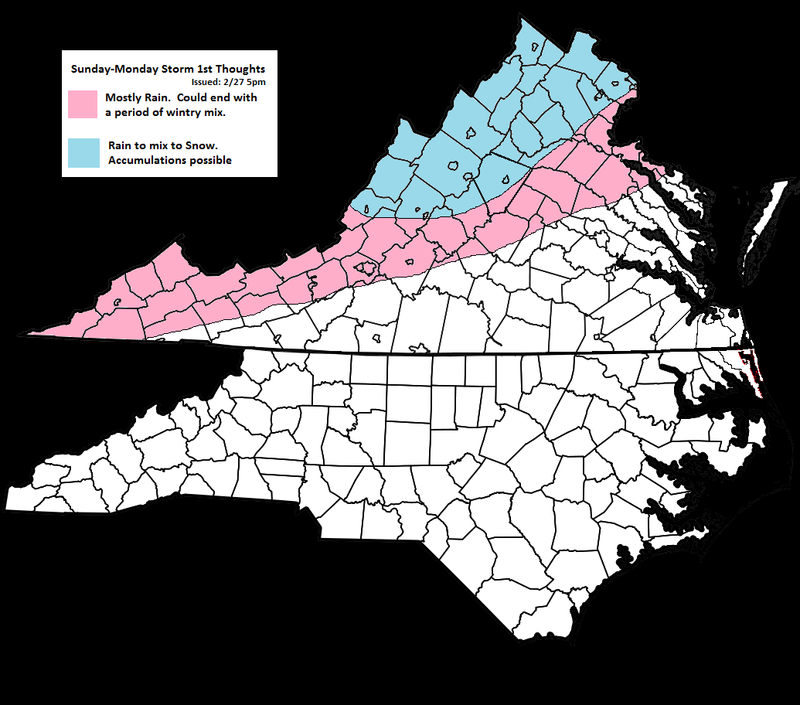 It looks like some areas of the state will have a shot at wintry weather late this weekend into early next week. On Saturday, a weak clipper system is going to push across the northern Great Lakes into eastern Canada. This system won't produce anything here, but it will be the clipper's trailing cold front that sets up our storm for Sunday night-Monday night. We are getting late enough in the winter that cold air masses aren't strong enough to push all the way to the Gulf states. A lot of times this causes fronts to get hung up, and slow down or stall. That's exactly what this one will do. Below shows the surface layer temperatures for Sunday afternoon at 1pm. You can clearly see that by this time the cold front is draped from the Texas-Oklahoma border up through the southern Ohio Valley and just north of the Mason Dixon line. An area of low pressure is going to develop somewhere across the Ark-La-Tex and ride along this boundary. A cold high pressure system will try to work in and edge the front farther south as we head throughout the later part of the day on Sunday and into Monday. This is going to lead to one of the scenarios where precipitation will begin as rain for most areas until enough cold air works behind the front to change things over to a wintry mix or snow. The graphic below roughly explains the setup. With these kind of setups where its a race between cold air working in and precipitation exiting the area, exactly how quick the cold front passes through will be critical. To give you a sense of how sharp the temperature gradient will be between areas south and north of the front, check out the gfs model's 2 meter temperatures for Monday at 1pm. We are talking about going from the 50s to the 10s in a matter of about 200 miles. For the reason stated above, I still think it's too early to put out any kind of exact numbers with this storm. It's going to come down to how much moisture is left once the cold front passes. Here are my early thoughts on how I see this playing out. I'll update as we get closer and try to start putting out some numbers once I'm a bit more certain.